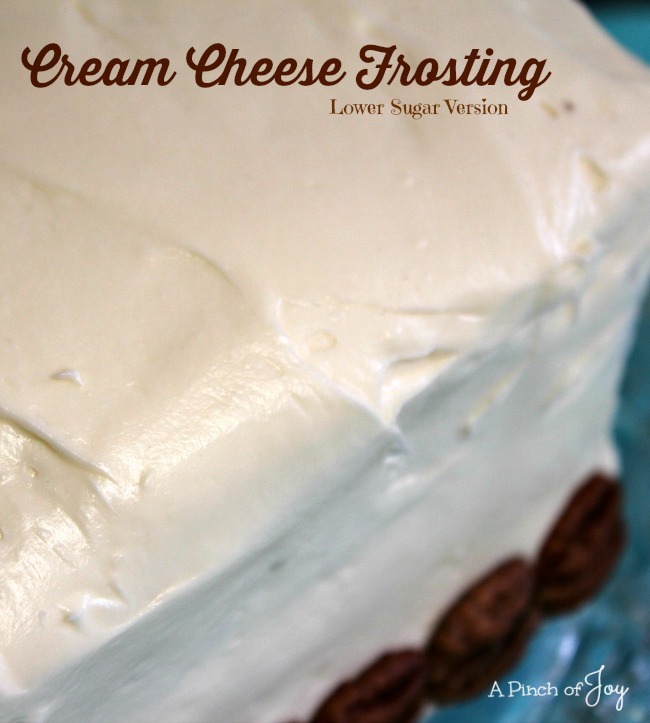 Cream Cheese Frosting (Lower sugar version) is a light, soft frosting. It spreads well, but is not suitable for decorating. It will hold things like chopped nuts or other embellishments — food or paper – but won’t hold shape. It’s not strong on flavor, has a very smooth texture, not sweet – it’s the perfect foil for a great cake! It enhances but doesn’t outshine unique flavors and textures, like Pumpkin Bars, Pineapple Spiced Carrot Cake or Hummingbird Cake. What other recipe gets top billing for being the perfect second banana to the star?? Make one batch to frost a 9×13 pan of cake or cakelike bars. To frost layer cakes, you will need to double the batch. A touch of salt can enhance the flavor. You can also add up to a cup more powdered sugar, if you need (which will, of course, up the carb and calorie count). If the day is very humid, or you will be transporting the cake, might be a nice option to know. Beat cream cheese and butter at low speed until light and fluffy. Add powdered sugar, 1 cup at a time. Beat until well incorporated. I just made a cream cheese frosting on Sunday! I only used 2 1/2 cups of powdered sugar, however, I did use a stick of butter 🙂 I prefer my cream cheese frosting with less sugar. Next time maybe I will try less butter. Thanks for sharing! Once you start using less sugar, your taste buds seem to change. Isn’t it amazing how all the things that used to be soo good are now too sweet?